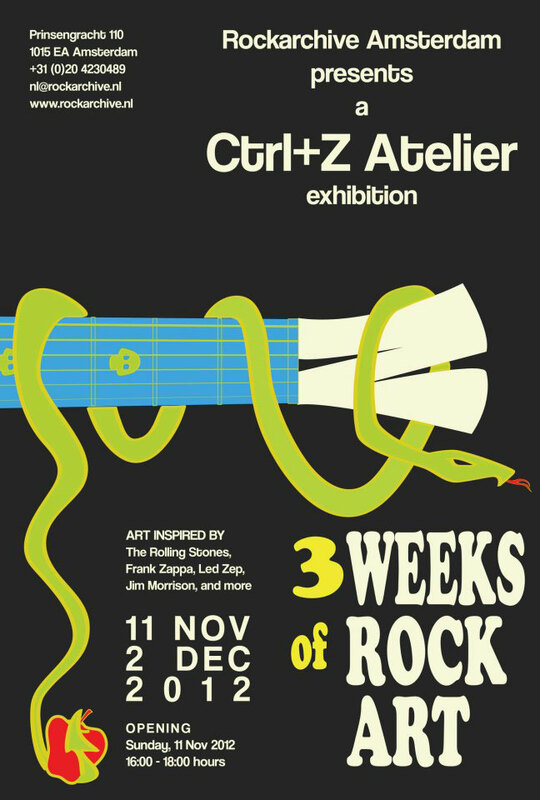 Rockarchive Amsterdam is pleased to present Three Weeks of Rock Art, a Ctrl+Z Atelier exhibition. This exhibition is a celebration of love and passion for rock music, shared by Ctrl+Z Atelier and Rockarchive Amsterdam. Ctrl+Z Atelier is an art and graphic design studio based in Haarlem, founded in 2012 by Jacopo Tenani (Italy, 1971). After graduating in Architecture at IUAV in Venice, Jacopo moved to Rotterdam in 2000 to attend a Master in Urban Design at the Berlage Institute. He then worked for over 10 years as architect and designer in the Netherlands. Meanwhile, his interest for graphic art kept growing, until he decided to create Ctrl+Z Atelier, an experimental framework where to explore and exploit the tensions between art and graphic design. Rock music and horror movies are currently the main inspiration for developing graphic artworks. Rockarchive Amsterdam was founded in 2004 as a photo gallery with a growing collection of classic images of rock and jazz, taken by the world’s leading music photographers.